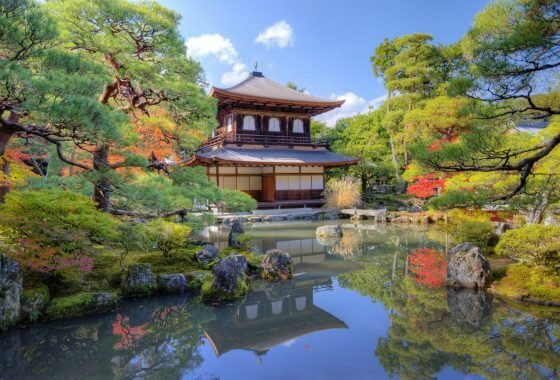 Kyoto is considered by many to be Japan’s most enchanting city. 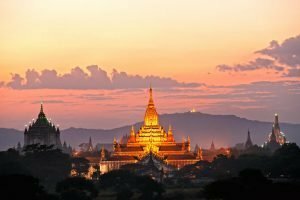 Imperial capital for over a thousand years, the city is a treasure trove of culture and heritage – it just takes a stroll down one of the old backstreets to catch a glimpse of the city’s traditional soul. 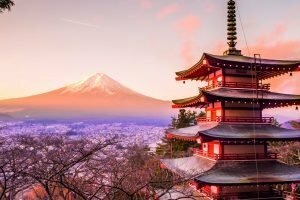 The ultimate showcase of the legacy of old Japan, discover a city full of tranquil temples, silk clad geisha and inspiring gardens. 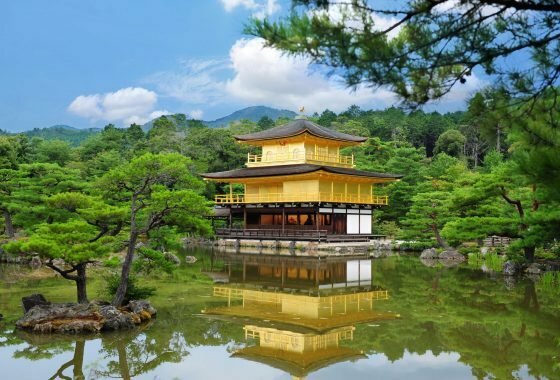 A Zen Buddhist temple set amongst the wooded hills, Kinkaku-ji, the Golden Pavilion, is one of Kyoto’s most enthralling sights. One of the 17 UNESCO-listed Historic Monuments of Ancient Kyoto, the main hall of the pavilion is covered in shimmering gold leaf, only enhanced by the reflecting pool that laps at its foot whilst the surrounding gardens are the epitome of classical Japanese garden design. With this spectacular view it isn’t a surprise that Kinkaku-ji is one of Kyoto’s most popular sights. The pavilion that you see today, though, is in fact a 1955 reconstruction after the 14th century original was burnt down by a monk. Ryoan-ji, another of the 17 Historic Monuments of Kyoto, is home to Kyoto’s, and in fact Japan’s, most famous Zen garden. 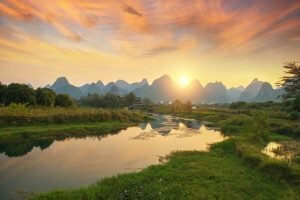 Both the garden’s origins and its meaning are unknown but it is believed to have been created in the late 15th century, perhaps as a riddle set by a Zen master for his students. The garden demonstrates perfect harmony and simplicity, its long walled rectangle of white gravel painstakingly raked daily by the temple’s monks. 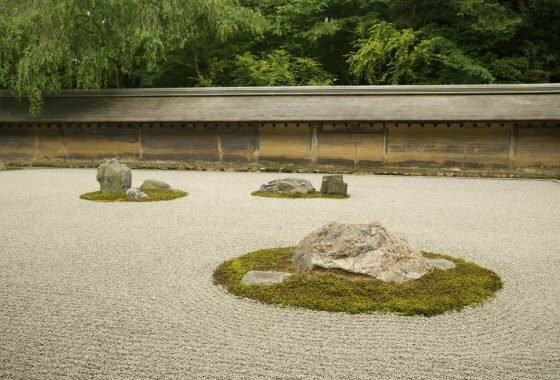 On the gravel are 15 rocks arranged in 5 groups – it is said that you can only see all 15 when you attain enlightenment. Also on the complex is the beautiful and lesser known 12th century lake garden which is well worth a stroll around. 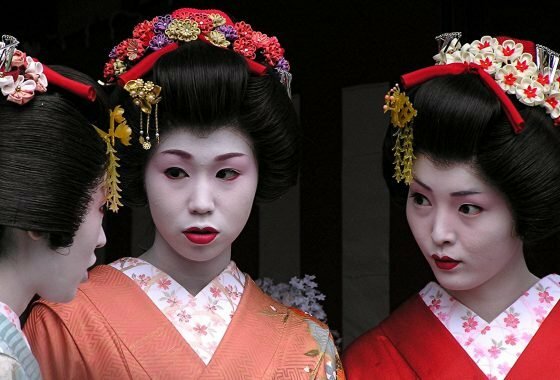 Though not exclusive to Kyoto, the city is considered the birthplace of geisha culture and is therefore the best place to experience, or at least spot a geisha (locally ‘geiko’). The district of Gion developed into a famous entertainment and geisha quarter in the 18th century, and whilst today it is thoroughly modern, there are still plenty of enclaves of the past. Dotted with old wooden teahouses, still exclusively used for geisha entertainment, it is at its most vibrant at night. Visit during the day though and you can also enjoy the historical buildings along the river front and plenty of bustling shops. Let us organise an authentic Kyoto experience for you – afternoon tea at a typical teahouse in the company of a geisha or maiko (apprentice geisha). As well as being able to talk to the geisha/maiko about her life, work and Japanese culture as a whole, you will also enjoy a traditional dance performance. The Kyoto residence of the first Tokugawa Shogun, Nijo Castle was started in 1603 and completed 23 years later. The ultimate show of power to the overthrown emperor, the castle’s fortifications consist of two rings of high, thick walls, each with a moat that surrounded the opulence of the inner palaces and gardens. The grandeur within is breathtaking – the very best artists of the time produced carvings and gilded screens to embellish the rooms, whilst the shogun’s paranoia of treachery led to the use of tricks and traps such as nightingale floors that ‘sing’ when stepped on. 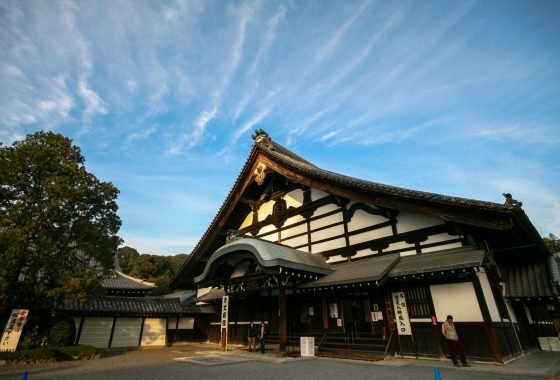 Nijo is also one of the 17 UNESCO-listed Historic Monuments of Kyoto. A vast complex of shrines spread across a forested mountain slope, Fushimi Inari-taisha was original created in the 8th century and dedicated to the god of rice and sake, Inari. Four kilometres of pathway wends through the woods past thousands of little sub-shrines, whilst there are five main shrines to admire. 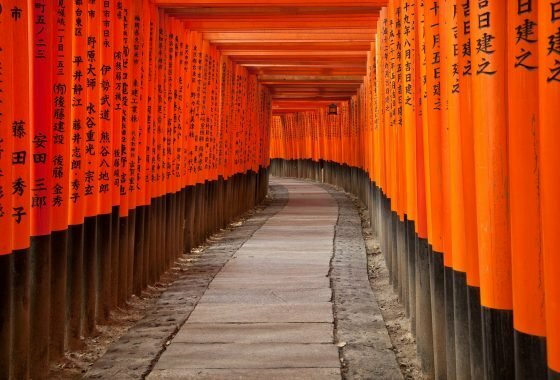 Inari in modern Japan is the patron of business, merchants and manufacturers – the vast tunnel of red torii (shrine gates) that led up the hill behind the main shrine is made up of individual torii donated by hundreds of local businesses. Built as a mountain retreat in the 15th century for Shogun Ashikaga Yoshimasa, the Temple of the Silver Pavilion, which isn’t actually silver, was converted into a Zen temple on his death in 1490. The pavilion itself is a simple structure set in sumptuous, landscaped gardens, complete with reflective pond, manicured trees and a raked sand garden all reached by an enigmatic high hedge-lined path. Nestled on its wooded hillside, Ginkaku-ji is one of Kyoto’s most celebrated sights, particularly spectacular in spring and autumn. 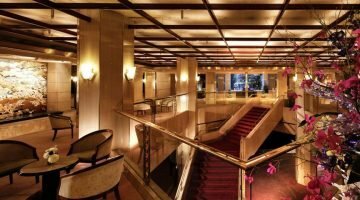 Considered one of the best hotels in Kyoto, the Granvia offers luxurious accommodation and first class service. Hotel facilities include a swimming pool, gym, sauna and Jacuzzi. There are several top quality restaurants offering a selection of local and international food as well as three bar lounges. The peaceful and modern ANA Hotel is centrally located opposite Nijo Castle and features many traditional touches alongside all the contemporary comforts. The hotel offers a range of restaurants, an indoor swimming pool, beauty treatments and a gym whilst there is even a small Japanese garden with its own waterfall! 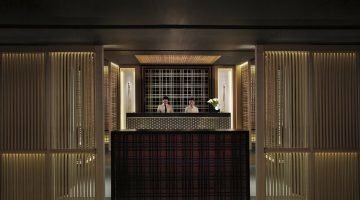 Opened in 2014 , the Ritz Carlton Kyoto offers the pinnacle of traditional Japanese hospitality. 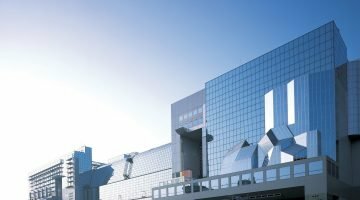 Set on the banks of the Kamogawa River, you'll have iconic views of Japan's most heritage filled city and accommodation that reflects the traditional aesthetic of the city. Revel in the sophisticated elegance and outstanding service of this luxury hotel, the perfect place to unwind after a day's exploration.